Birthday Parties cannot be taken easier. Especially 1st birthday parties require special attention. A lot of effort is required to conduct a birthday party successfully. While some people celebrate the 1st birthday party in a traditional way, a lot of people choose to have the birthday party arranged for the guests with different birthday party themes. A well arranged birthday party can make you relaxed at the party time and let you enjoy the birthday moments. Here are some basic tips from me for choosing the items for different birthday party themes. Never do any experiment by buying any new flavors if you are inviting guests. As the kid is just one-year-old, it might not have any preferences or specific about any themes. Be wise in choosing a good cake within your budget. Plan and buy the required quantity of cake. Do not order more and end up in wasting a lot. It is good to have a single candle instead of going with multiple candles. It creates a lot of mess and might spoil the cake too. It is good to choose a numbered candle. It looks neat and elegant. Buy a tall candle to avoid creating a mess with the cake. Try to stick with only 2 colors of balloons. Buying balloons in a lot of colors might not look good. White and Blue is the traditional combination that goes very well for birthday parties. Do not hang the balloons where kids have easy access. Have some blown spare balloons. Few kids might cry to get the balloons. Try to buy a poster in bright colors. A lite color post might not look attractive. Make sure that the poster has the baby name printed on it. It will be easy for the guest to wish your baby. Making a collage of your baby photos is a very good idea. Choose a Banner with a message. Make sure that you have a banner for welcoming the guests near the entrance of the party hall. It is good to choose a glowing banner that makes the party hall more attractive. Hats are the easiest way to make the kids happier. Make sure to distribute the hats before the cake cutting time. You can avoid the last minute chaos. Make sure you have sufficient quantity of hats. Otherwise, you might need to spend time in resolving the disputes among the kids. Party poppers can make any simple birthday party a grand one. Some party poppers make a huge sound. If your baby is afraid of it, try to deviate him/her. Avoid it if you feel that the baby might get afraid of it. It might spoil your baby's mood and might start crying. Give this job to an adult or matured kid to avoid troubles. Ask them to read the instructions carefully. Instruct the parents of kids on how to protect the kids. A good quality paper plates and cups are must buy for any birthday party. Make sure that you have enough stock of the plates and cups. It is good to have plastic spoons to avoid guests running to washrooms. There is a lot of options available nowadays like Rope Lights, Laser Lights, Disco Lights and so on. If you are spending a huge amount on buying lights, make sure that you get a good quality one that can be used for a long time. Not everyone has easy access to the above party supplies. Even if you can find a shop, you might not be able to find different varieties. 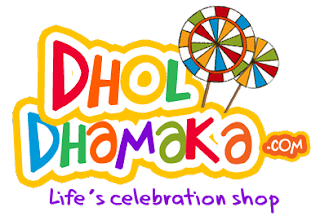 Instead of spending a huge amount for the third parties to buy your desired party supplies, you can now order the birthday party supplies at DholDhamaka. Free shipping for all the orders above Rs.250. You do not need to pay any additional amount for labors when you can buy on your own. Huge varieties of party supplies are available. You can buy the products on discounted price.